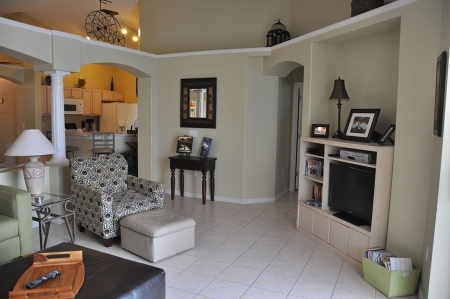 You'll feel right at home in this 4 bedroom, 3 bath executive villa. This villa features two queen master suites with private baths and direct access to the pool and spa area from each master suite. There are 2 additional bedrooms decorated just for your little princess, and sports fan! 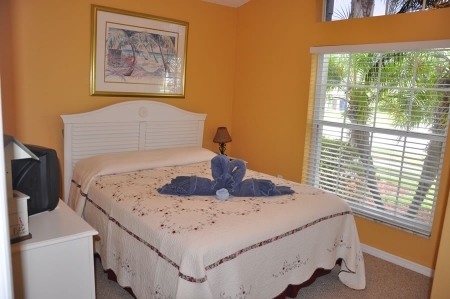 Three of the bedrooms feature cable TVs with a flat panel in one of the masters. There are also 2 DVD players. The living room features a 37'' flat panel LCD television, and a sliding glass wall that opens to the pool and spa area. 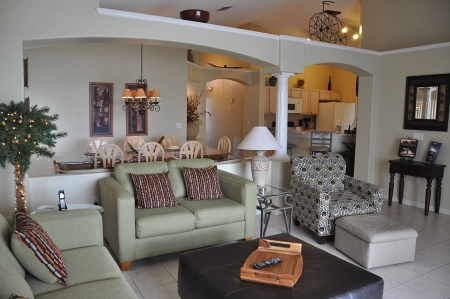 It is beautifully furnished and comfortable with 2 sofas and just off the kitchen so you'll enjoy the true Florida open living style. In the kitchen you will find all you need to prepare a great dinner, but with the open floor plan to the living room, you'll never feel far from the rest of your family. The bigger children will enjoy the play room with a Sony Playstation 2, while smaller children can enjoy the Lego area! This villa also features free long distance phone calls within the US, and free WiFi broadband internet, just bring your laptop. Other features include child fence around pool and spa, alarm system and more.